Crafted in luxurious 9ct gold and set with sparkling diamonds totalling 0.15cts, this oversized statement ring features a beautiful interlocked twisting design that's made to stand out. Coordinate with other gold jewellery for a polished finish, or contrast with bright jewel tones for a contemporary feel. 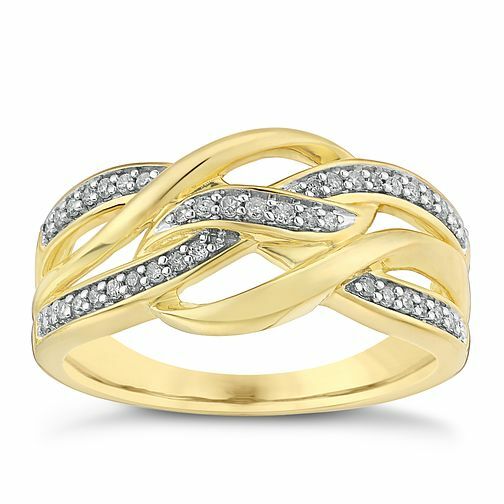 9ct gold 0.15ct diamond ring is rated 5.0 out of 5 by 2. Rated 5 out of 5 by Anonymous from Lovely ring This ring is exactly as described, well worth the money although I had seen the ring in store this was the first time I have bought jewellery that was not costume jewellery on line excellent service. Rated 5 out of 5 by Anonymous from A wonderful wedding ring. I brought this wedding ring for the wife as a Christmas present. When it arrived i had a look at and. Was well impressed with the ring, when the wife opened the present on Christmas Day she was over the moon with the ring and she has showed it off to family, friends and her work colleagues.